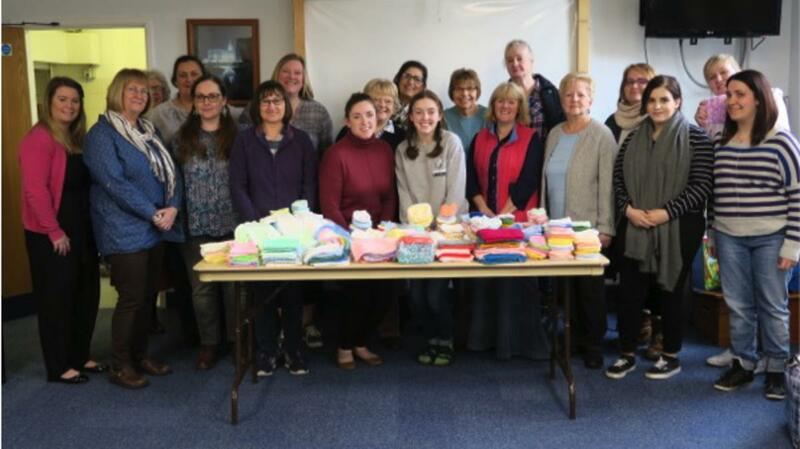 Norwich Stake Relief Society sisters met at the stake centre on Saturday 10th March 2018 to join together in efforts to provide for women in need. The service activity comprised two areas of focus: a collection of sanitary products for girls and women in the local area; and the collection and creation of items for unwell and premature babies. Initially, members of the Stake Relief Society presidency were considering preparing reusable sanitary protection for use by girls in developing nations. However, Stake Relief Society President, Sister Butcher discovered that her local branch library, along with other branches of the Norfolk Libraries service, was collecting and distributing sanitary products to those in need locally. It was decided that Norwich Stake Relief Society would support this initiative. This is in keeping with a message shared by Linda K. Burton, then-Relief Society President, in her address at the General Women’s Session of the April 2016 General Conference: “What you have done is a very good thing. Now go home, walk across the street, and serve your neighbour!” (Linda K. Burton, “I Was a Stranger,” Ensign, May 2016, 15). Sisters across the Norwich stake were invited to donate sanitary products for the Norfolk Libraries initiative, and to bring them to the service activity. During the activity, the items were bagged up for delivery. Sister Joy Butcher took the donations to her local library after the activity, and staff there were surprised to see just how many bags she brought! The second area of focus for the service activity was knitting hats for premature babies and bonding squares for use in neonatal units. Bonding squares are knitted in pairs. One square is placed in the incubator with a premature baby; the other is worn next to the mother’s skin. The squares are swapped over when the mother visits the baby, and this can help the two to bond as they become familiar with each other’s scent. Many sisters across the stake had prepared both hats and bonding squares before the service activity, and time was also spent creating these items as the sisters gathered together. The Stake Relief Society presidency thanks all the sisters who contributed to the service activity in any way. Although we were few in number at the stake centre, the efforts of all who made donations combined to bless the lives of other daughters of God. What a blessing to use our hands to do His work!